Rogue Productions, the team behind Lamplighters, have worked with gaming companies like Capcom and Warner Bros. on experiential entertainment, as well as escape rooms, immersive theatre and more. Their aim is to allow audiences to play as much as watch and that's an integral part of this show: there's role playing, puzzles to solves and mysteries to uncover. Of course, immersive theatre isn't a new phenomenon. But often it's done on expansive sets with huge budgets and fancy gimmicks, where the story is frankly difficult to follow. Here, though, there's one room, a handful of props, a willing audience and just one performer. 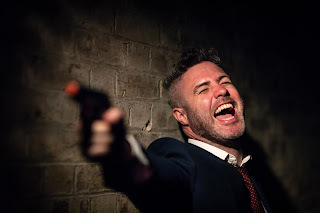 That performer is Neil Connolly, who manages to balance charm and childlike glee with atmospheric storytelling. He is our Spymaster for the evening and he invites us on to the stage to take part in what is essentially a play set. We are all big kids here to have fun with silly spy toys as much as to be intellectually stimulated. Yet stimulated we are. Connolly tells us with great enthusiasm about his fascination with spies as a child and, specifically, the novels of John le Carré. It's these that inspire the plot of the show, where audience members play spies, moles, agents and everything else. We shout out ideas for plot points. We solve puzzles. We are sent on secret missions (to the bar). We dodge laser beams. We shoot and kill. But did we kill the right man? The plot, in all honesty, isn't always easy to follow. But if anything, that's our fault more than Connolly's. Our fault for shouting out silly ideas. Our fault for underscoring at prime moments with children's toy instruments. Our fault for simply laughing too much and not paying attention. And frankly, who cares who the mole is? Rarely is theatre this much fun. 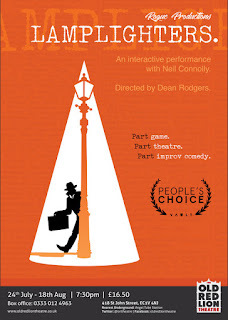 With Lamplighters, Rogue Productions take the idea of "play" literally and put it on a stage. It is rampant and chaotic, uniquely immersive, frivolously silly and hugely entertaining because of it. 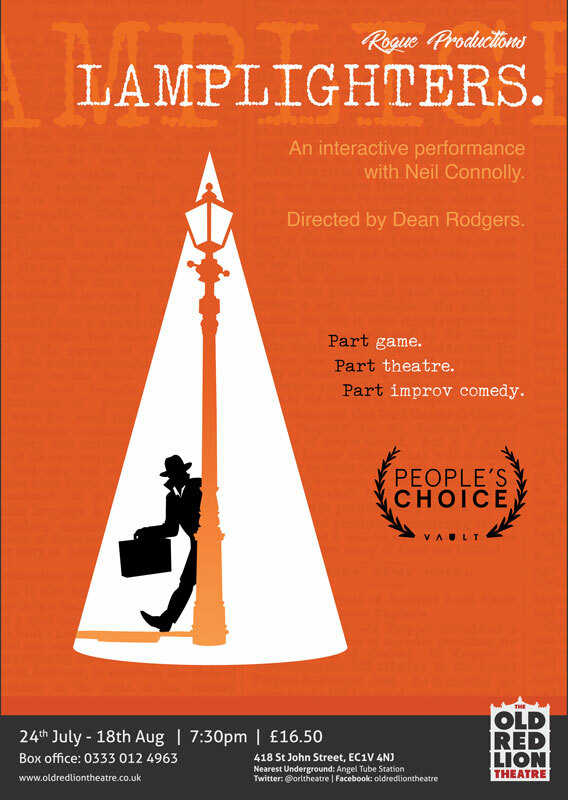 Watch: Lamplighters runs at the Old Red Lion Theatre until 18th August.